An ongoing lesson from 2011’s Fukushima Dai-ichi accident involves U.S. reactors better understanding their earthquake hazard. Reactor owners in the Western parts of the country have had to assemble a particularly complex jigsaw puzzle of seismic information. They’ve just sent the NRC their detailed re-analysis. How an individual site’s geology can affect quake energy before it hits the reactor building (site amplification). Central and Eastern U.S. reactors benefitted from region-wide updated earthquake source information and a model of quake energy transmission for the first two pieces. Plants west of the Rockies, however, had to deal with the West’s more active and interconnected faults. Columbia, Diablo Canyon Part I and Part II and Palo Verde used the Senior Seismic Hazard Analysis Committee (SSHAC) approach to develop site-specific source models and ground-motion models. This group of independent seismic experts develops guidance on major seismic studies such as this. The group has met several times the past few years to ensure the Western plants properly conduct and document their seismic activities. 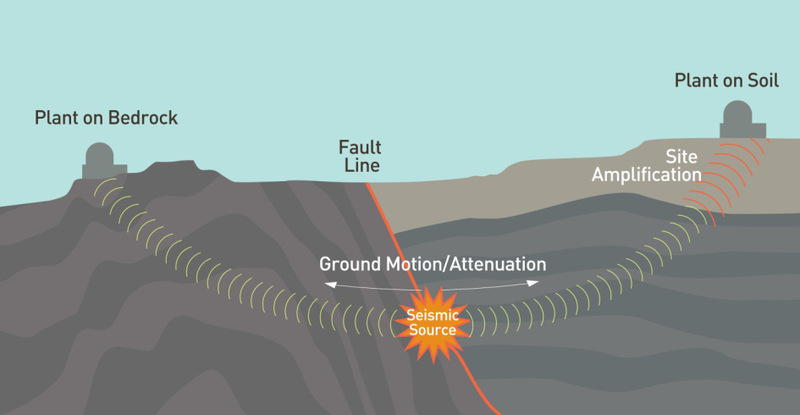 The NRC carefully considers SSHAC comments and recommendations before the agency comes to its own conclusions on seismic issues. We’re currently evaluating the Western plants’ reports and will issue our short-term screening and prioritization review later this spring. As for the Central and Eastern U.S. plants’ March 2014 submittals, we screened them to determine what other actions the plants might have to take. Plants that have more to do were grouped into three priority groups with staggered deadlines. Many of those plants submitted additional analyses in December 2014, and the NRC continues reviewing both that information and the March 2014 submittals. We have let the nuclear industry screw around for over 50 years to secure the nuclear waste as required to build plants. They have and still are doing nothing because they know that the cost is to high, the government has to step in and do it and bill the nuclear power plants before they take the funds set aside to do this if not already taken. They are stalling and using the funds for studies that they will never agree to because of cost that will wipe out their funds for handling waste material if any is left which brings up “have they any funds left, tapping into it in the past. If both “engineering judgment” and “seismic PRA” are flawed, do you have a suggestion what shall be done instead, considering your comments about Paul and Imre is well taken. In re seismic safety of Diablo Canyon and others, the framework for such evaluations has shifted from “engineering judgement” in the mid 20th century to probabilistic approaches now dominated by “geoscientists” but bearing many fossil engineering concepts. Both of these approaches have proven to be seriously flawed and have consequently now been reformed by the SSHAC movement which invokes a vague “community of experts” and is being used on current NRC submittals. But this technique like other such efforts carries the stamp of typical American quasi-religious movements and it is not unlikely that it too will give way to something new, perhaps a wholesale abandonment of PRA as a failed paradigm. NRC reviewers of the current batch of submittals should be aware of this history. A little boning up with Feyerabend and Lakatos might be in order. We definitely need global #RealNuclearWasteConfidence and we need our states to initiate personal responsibility and jurisdiction where the NRC needs help to implement a comprehensive program to get this entire science/industry back to a fundamental #SafetyFirst mindset. When Fukushima was been built it was known that tsunamis were very high in that area(many had grandparents that experienced it). Proof do a search, there is no way that people in the field of earth quacks and tsunamis would lie, so who did? Nuclear energy industry will continue as long as federal subsidies & investors bring trillions into their coffers. Petition your elected officials to eend these taxpayer funded subsidies. We need to fund solar, wind, wave, hydro projects now. Creating vastly more permanment jobs than nuclear energy. On so many levels, nuclear energy industry is a dying dinosaur in it’s death throes. The sooner it goes the safer our shared world will become. Fukushima proved that Nature can destroy any land based nuclear reactor, any place anytime 24/7 despite what spec.’s the NRC or any other entity can specify and that does not even include mankind manipulation of Murphy’s Law! Can you provide links to substantiate your allegations? Why is the NRC accepting reports from the plants (they have lied and held information before). Recieve studies direct from those in the field of earthquakes. How can we trust that plant owners will not hold back negative results or over ride risk evaluation. How come Fukushima was not designed for the tsunami that was predicted to be concomitant with the earthquakes it was designed for? This is like designing for a hurricane, but not designing for the flooding that goes with it. What’s to consider? We are now storing SONGS spent fuel between 2 known major active earthquake faults. When, not if, these 2 shift, we lose control over this spent nuclear fuel storage. Millions of our citizens are told “shelter in place” without adequate preparations, as freeways will become stalled parking lots of panicked/irrational crowds. Parents will attempt to reach their children at schools. Teachers will be “sheltering in place” without emergency supplies with or without help of 1 class aide. What could possible go very wrong with our current plans? Time to remove all spent nuclear fuel to unpopulated areas. I trust someone is discussing the desert conservancy plan here in california and we can integrate a SANE response to our past stupid decisions! I don’t know, maybe I AM the moron in the room, just no one has yet to tell me #fuqafukushima #nuclearizedwater actually can freeze so my ice cubes are safe! Shutdown Diablo canyon. Move the nuclear material to a safer location before it doesn’t matter we even bothered having this conversation we should not be having if all, if things were equally and we knew then what we know now. Even the industry will thank you one day.